Protecting the tools « She just can't sit still! 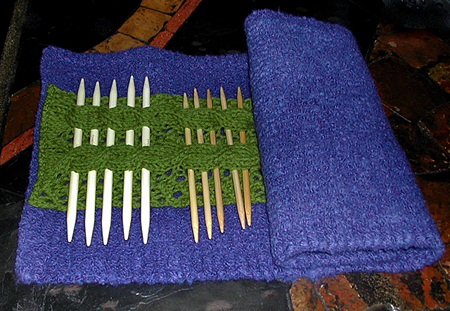 Inspired by Berrocco’s Kable and Kluster, and I set about to design something to store my growing stash of double pointed needles. I started by finding some gorgeous, more about bold purple felting wool roving (about a pound of it). 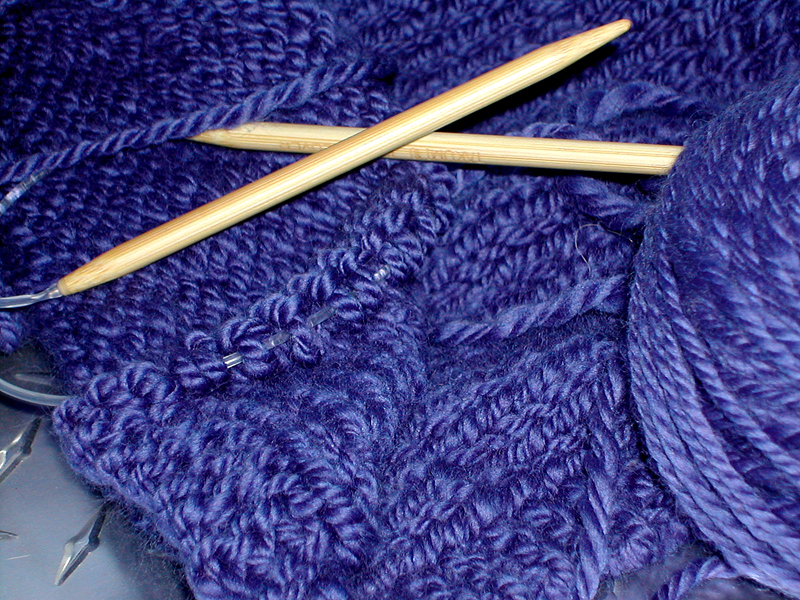 I spun it up and knit a large rectangle with a ribbed border. Then I felted it in the washing machine until it shrunk up to the size I wanted, treatment which was a little wider than the biggest double points I might keep. 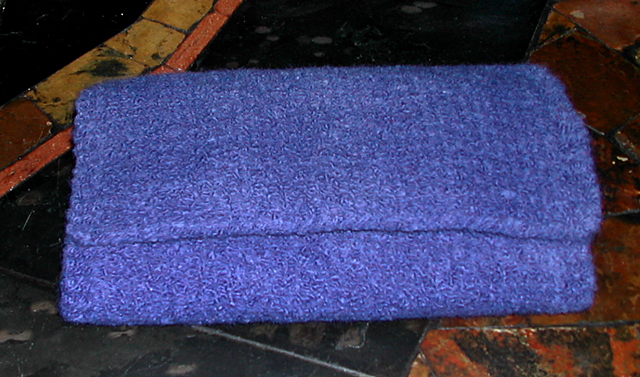 The final measurements were 24.5″ x 11.5″ I probably shrunk it down by nearly 2.5 inches to a nice tight felt. The idea was to have a roll that would store and travel nicely. 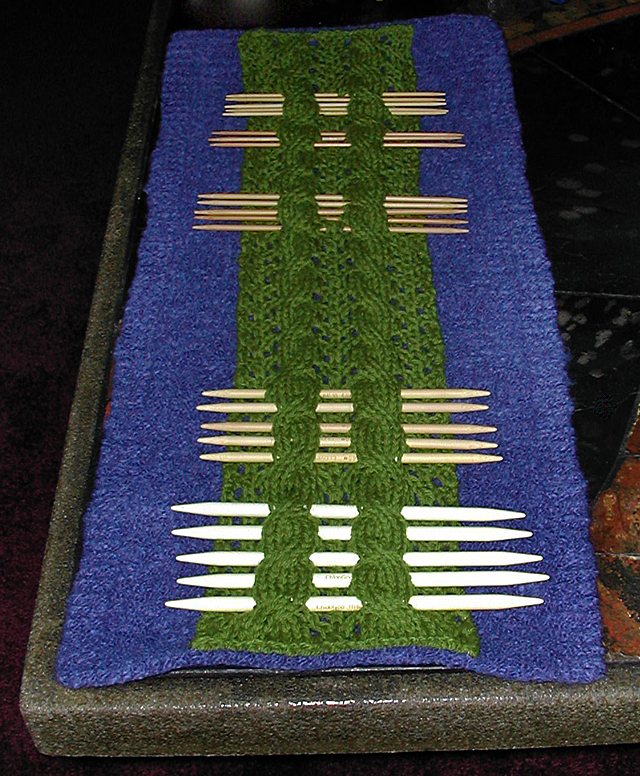 I want to eventually finish the outside with two attractive buttons with loops, but I am waiting until I get a few more of the larger DP needles to see how tight/loose it should be when rolled up. I went looking through all my lace patterns and found one that worked with just a little modification. It’s a vine and cable mix that allows two areas to encase the needles with makes the whole thing far more stable and secure than a single cable would. I used an acrylic worsted weight yarn which has a wonderful grip to it. The needles don’t slide out at all when held on edge. What I love best about this carrier is that it holds any size DP needles comfortably. I didn’t have to make adjustments for my size 11 needles or my size 2’s. This is the finished DP needle case. It was fun to employ a lot of different techniques and styles to make a fun case to protect my DPs and keep them all in one place. My next toolcase is going to be a similar style, but instead of the cables, I’m going to make a series of pockets to store all of my circular needles in one place. I’m still working on the dimensions for that. Clicking on most pictures will display a larger picture for detail. This entry was posted on Sunday, July 22nd, 2007 at 8:13 am	and is filed under Fiber Arts, Knitting, Spinning. You can follow any responses to this entry through the RSS 2.0 feed. You can leave a response, or trackback from your own site. This is a fabulous idea. Do you mind if I gank it for my personal use?? I love this.